Chicago Books to Women in Prison is an all-volunteer group that distributes paperback books free of charge to people incarcerated in women’s prisons nationwide. We are dedicated to offering women behind bars the opportunity for self-empowerment, education, and entertainment that reading provides. Incarcerated women send us their requests for books directly. We match each request from our stock of thousands of donated books. We send three books in each package. Our most popular request of all time is a paperback dictionary, but we send a great variety of books every week. Reading the letters we receive from women in prison, one begins to get a sense of the overwhelming need for projects like this one. We hear over and over that rehabilitation is not a priority and prison libraries tend to be dismal, if they exist at all. There are many ways you can help by giving your time, books or a monetary contribution. We especially welcome money for postage, which is our largest expense. If what you want to donate isn’t listed below. Before organizing a book drive. Before assembling a donation of more than a few books. We get many requests for certain kinds of books that are rarely donated. Please take a look on your bookshelves. You may find books that we could put to good use. Or buy one (or more) for us the next time you shop for books. Please bookmark this page on your smartphone for easy reference. Books should be in very good condition, as we aim to send the best quality possible to the women we serve. New or nearly new books are especially appreciated as some prisons require them. Advance reader copies (ARCs) are welcome. Here are the paperback books we need most as they’re in high demand, but are rarely donated. In general, we can only use books that are 10 years old or less. We can only use paperback books. No hardcovers, please. We do not need coloring books or children’s books at this time. We do not need most fiction, nonfiction or Christian materials in English other than what is on the list above. This is because we receive a continuous supply of these books throughout the year. But please feel free to check with us by email as you may have some wildly popular or hard-to-find authors. Our storage space is extremely limited. Please keep in mind that when books are donated that we can’t use, we must find somewhere to donate them in turn (or recycle them if they’re simply too old or in poor condition). A tax-donation receipt is available upon request. If you’re not sure based on the information above whether we can use your books, please ask first. You may drop off your books 2–4:30 pm any Saturday or Sunday. We’re located at 4511 N. Hermitage Ave. (Hermitage and Sunnyside). We’re only two blocks from the Montrose Brown Line stop. There is also plenty of free street parking and a loading zone in front. Please do not simply leave books outside the church where we make our home. Questions? Want to make a large donation—that is, more than a bag or box of books? Need to make special arrangements for getting your books to us? Think we may be interested in something that isn’t listed? Please ask at chicagobwp@gmail.com. We ship bulk to a number of prisons—that is, we pack several book orders in one carton. This saves on postage, but it means we always need sturdy corrugated shipping boxes. A good size is approximately 16″ x 12″ x 12″ or a little smaller. Boxes should be in good condition and flattened; they can have logos or old shipping marks. 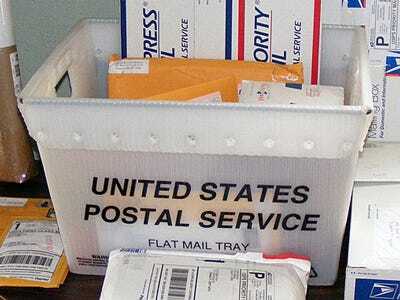 We use USPS flat mail trays to organize our weekly mail pickup. (Here’s what they look like.) They’re free at any Post Office. Mention that you need a few for business mail preparation and pickup. We do not need brown paper grocery bags, which we used to use for packaging book orders. Leave your email and a note stating which items you can fullfill and we will forward it to Chicago Books to Women in Prison once you hit the "Complete" button below. In addition to the books we always need, we occasionally get requests for books that are rarely donated—and that would make a significant difference to the woman making the request. Recommend Chicago Books to Women in Prison! "Literacy can change people's lives. This organization brings books to people and places that need books, especially to incarcerated women. Their dedication is amazing." Visit us at Chicago Books to Women in Prison to see more information.